Still have a little more work to do on Ryan Lewis’ jacket. Next I’ll add the background to the piece, and then go back in to draw the final details to the faces. Almost done! Adding the first layer on the beard of Ryan Lewis. Facial hair can sometimes be a little tricky since it’s density varies. For example, the hair on his chin is thicker than on his cheeks. Accurately capturing this difference is key to maximizing the look and feels of realism. I’m goin’ iiiiin!!! The fabric of Macklemore’s jacket is really dark, but there are still subtle differences that define the shape and texture of the fabric. Trying to capture every ounce of detail. Today’s my birthday and, as I often do on this day, I’ve been reflecting on my life, where I’ve been, and where I’m going. Music has always been a powerful medium for me to connect with. 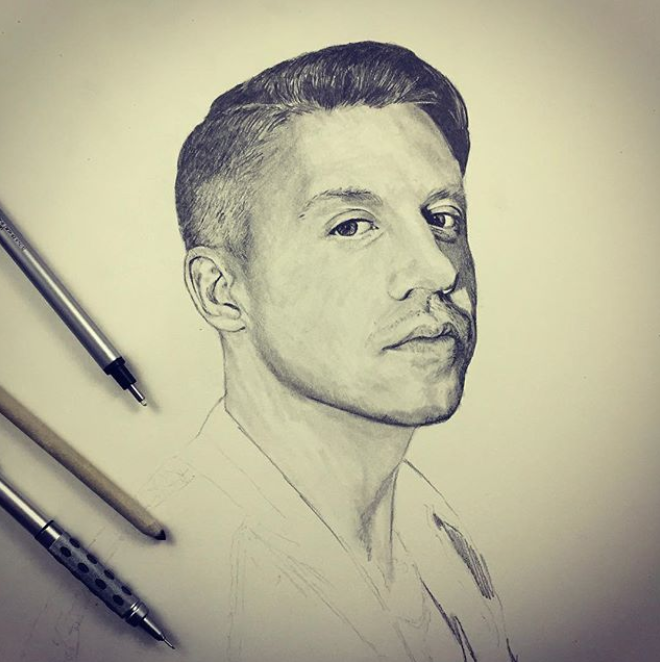 Adding a few subtle details to Macklemore’s ear. To really get that hyper-realism look, I not only add layers of shading with my pencil, but also take away layers with my eraser. This gives the piece a much broader range of gradation and allows me to capture all the smallest details. Big thanks to David Needleman for the amazing photo! You rock!